Seminar, a play by Theresa Rebeck, pretty much discusses the agony and ecstasy of writing as well as the writer's dilemma of whether what they have to say is good enough. The excellent script is well matched by it's high calibre cast. I also have to say that the other thing that stood out for me was the great incidental music used for scene changes by John Gromada. It's as if it makes the stakes higher for the characters with every scene change. Listen for it! 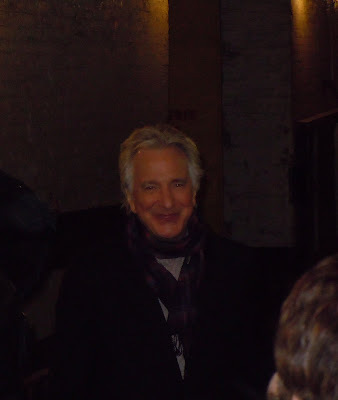 I feel lucky to have seen Alan Rickman in this play as Leonard. He has such stage presence to draw you in but not so that he upstages his co-actors. Here's Mr. Rickman all smiles coming out to meet the audience at the stagedoor. I didn't get to see Lily Rabe as Portia in Merchant of Venice but I'm so glad I got to see her here. She was perfect as Kate. Actually the night before I saw the show, Lani and I passed by the theatre so I can get my ticket from the box office and we happen to stumble upon the red carpet of Seminar's opening night! Here's Jerry O'Connell and Rebecca Romijn being interviewed.